Micks Web Design is a small website design business located south of Sydney in the St George area. Mick designs, develops and implements professional websites for small and medium businesses. A personalised website showcases the business. Helping to achieve the business’s individual goals. Mick ensures a website design that is simple and easy to use on any electronic device. This includes tablets and mobile. Micks Web design helps to promote the business’s website. Search engine optimisation (SEO) techniques are used to increase the visibility of the website when searched on the internet. Micks qualifications include Certificates in Website Design, Multimedia and Diploma of Website Development. 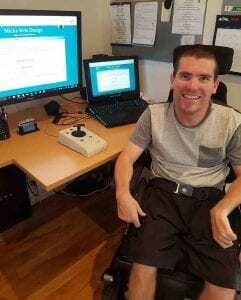 Micks Web Design was established in 2012, due to Micks physical disability, he works from home and uses an electric wheelchair for mobility. Most of all, the websites created by Mick are accessible, easy to navigate and user friendly. Mick enjoys spending the necessary time to create a simple and personalised website. Promotion using a website is vital to help your business to excel. It is also important to ensure everyone is able to quickly find what they are looking for with ease. It is important that a website promotes the business’s goals. Likewise making the website personalised ensures your website is authentic. Without delay contact me for a quick, obligation free and reasonably priced quote.